Marked by an array of prayer flags & 108 chortens, “The Dochula pass” is at an altitude of 3,050 meters above sea-level and it is the first high pass in the western region which is 23 kilometers from Thimphu on the way to Punakha. On a clear day a panoramic view of the Bhutanese Himalayas can be seen from here. 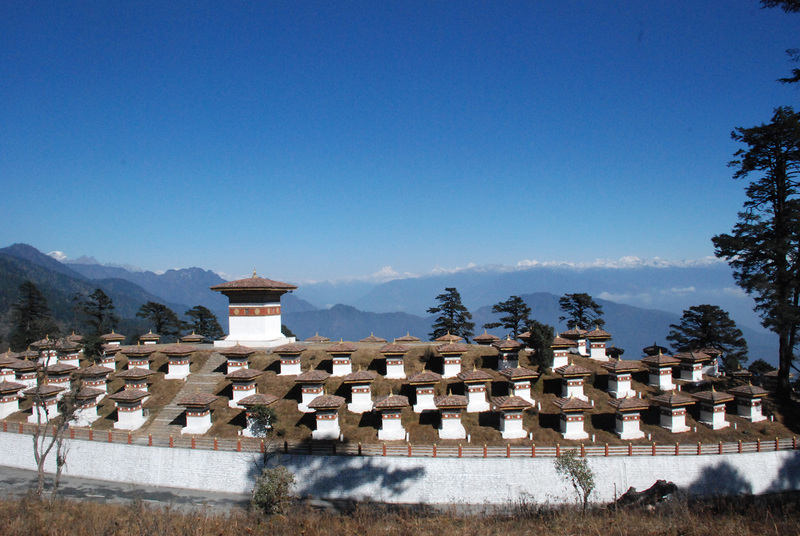 The 108 chortens and the Druk Wangyel Lhakhang, built by Queen Mother Dorji Wangmo Wangchuck to honor His Majesty the Fourth King in 2003, are some of the main attractions there. 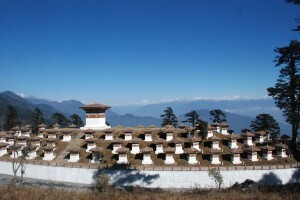 The Druk Wangyal Chorten stands on the crest of Dochula overlooking the unique spiral of 108 chortens. More than half an hour drive will take you there. Apart from this, there is also a short hiking route up to the “Lungchuzekha temple”.